A group of investigative journalists at the Boston Globe spend a year following the trail of the Catholic Church’s abuse of children. They uncover years of institutionalised cover-ups from within the Church as well as its supporters, eventually leading to the revelation of abuse all over the world. A true story. 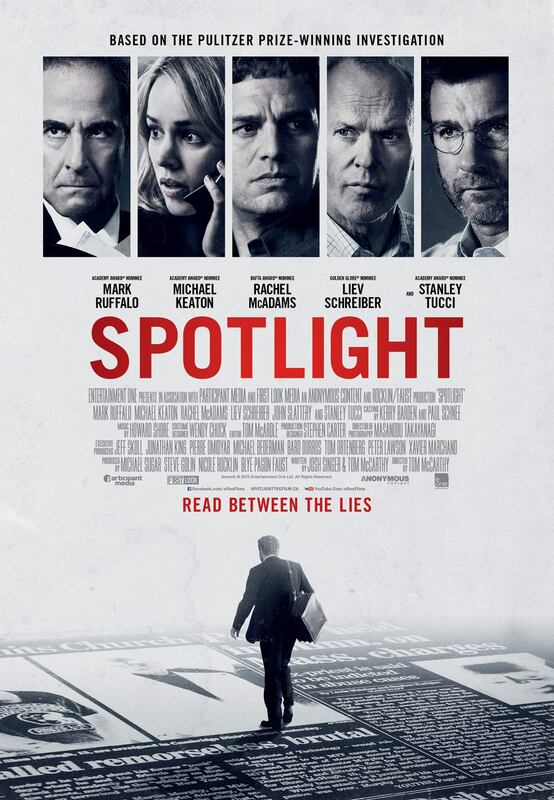 Nominated for 6 Oscars, I thought Spotlight would be worth a go. While it was interesting, I wouldn’t say it’s an Oscar-worthy film. I enjoyed it, and I didn’t know all the details of the investigation before so I definitely came away having learnt something- however the filmmakers can’t get credit for the plot since they didn’t come up with it, so no points for that. 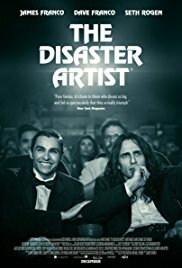 Mark Ruffalo is really good in this- I think he’s often quite underrated as an actor, he can do a wide variety of different kinds of roles or genres but he never seems to be the star. Michael Keaton’s renaissance following last year’s Birdman also continues. However, it’s a good film and I’m glad I saw it, but it’s wasn’t a showstopper. It’s pretty slow, although I suppose it would have been hard to cut out certain details otherwise it simply wouldn’t make sense. Now I’ve seen it, I don’t think I need to see it again- I’ve got all I can from it (mainly the story) from the first viewing. It’s definitely a thinking film and you need to be awake to be able to sit through it and understand everything that’s going on. Obviously the subject matter isn’t by any means lightweight, and I think to enjoy it you’d have to be in the right mood- don’t just pick it because you want something to watch, pick it because you want to know that specific story. 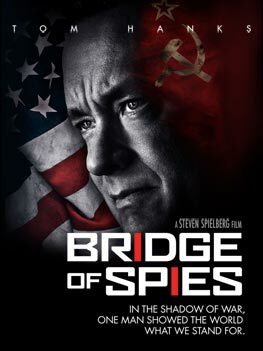 During the Cold War, a moral and just American lawyer (Hanks) represents a man accused of being a Russian spy. Later, he is recruited by the CIA to act as a negotiator when the Russians capture an American pilot and want to trade him for the alleged spy that the lawyer was representing. Based on a true story. There was quite a big build up to this film, as there often is with Spielberg. As a run-of-the-mill political/historical drama, it’s a good one, but nothing special. The story is interesting, but since it’s based on real events you can’t really give the film itself credit for that. It’s paced nicely, slow enough so that layers of the plot can build up but also lightweight enough to not be too wordy and legalistic. The main thing that bothered me was that it was typically pro-American. To be quite honest, I found this so annoying to the point that I kind of was hoping that the Russians would screw the Americans over. There’s a scene in the movie (don’t worry, this isn’t a spoiler) when Tom Hanks is on the Eastern side of the Berlin Wall and sees Germans trying to climb over it to the West, and they get shot. Then the final scene of the film is Hanks travelling on a train back in the good ol’ US of A, and he sees kids jumping over fences carefree, at which point we’re supposed to think what a wonderful place America must have been to allow people to so freely jump over walls into private property without consequence (which is certainly not the case in reality). I didn’t really appreciate the blatant false representation of America, and I guess I would hope that most audience members wouldn’t buy into it. So all in all it’s an interesting yarn, I like Tom Hanks as per usual, and for those interested in history it’s worth a watch. However I wouldn’t say it’s a classic, and take it with a pinch of salt.